Download "ADMINISTRATIVE REGULATION AR: 6.03 DATE APPROVED September 10, 2002 ORIGINATING DEPARTMENT:"
1 ADMINISTRATIVE REGULATION AR: 6.03 DATE APPROVED September 10, 2002 SUBJECT: ORIGINATING DEPARTMENT: Debt Management Policy Office of Management & Budget Page 1 of 8 I. 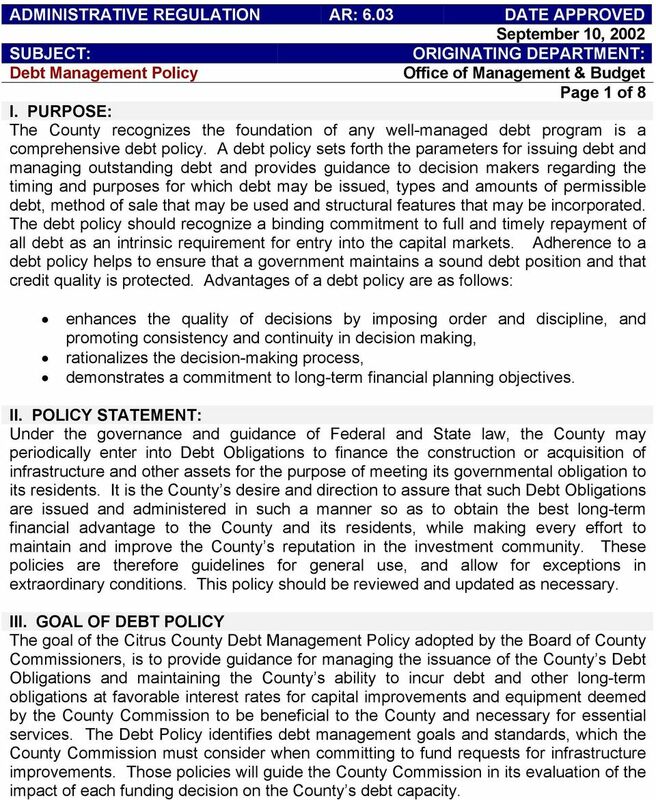 PURPOSE: The County recognizes the foundation of any well-managed debt program is a comprehensive debt policy. A debt policy sets forth the parameters for issuing debt and managing outstanding debt and provides guidance to decision makers regarding the timing and purposes for which debt may be issued, types and amounts of permissible debt, method of sale that may be used and structural features that may be incorporated. The debt policy should recognize a binding commitment to full and timely repayment of all debt as an intrinsic requirement for entry into the capital markets. Adherence to a debt policy helps to ensure that a government maintains a sound debt position and that credit quality is protected. Advantages of a debt policy are as follows: enhances the quality of decisions by imposing order and discipline, and promoting consistency and continuity in decision making, rationalizes the decision-making process, demonstrates a commitment to long-term financial planning objectives. II. POLICY STATEMENT: Under the governance and guidance of Federal and State law, the County may periodically enter into Debt Obligations to finance the construction or acquisition of infrastructure and other assets for the purpose of meeting its governmental obligation to its residents. It is the County s desire and direction to assure that such Debt Obligations are issued and administered in such a manner so as to obtain the best long-term financial advantage to the County and its residents, while making every effort to maintain and improve the County s reputation in the investment community. These policies are therefore guidelines for general use, and allow for exceptions in extraordinary conditions. This policy should be reviewed and updated as necessary. III. GOAL OF DEBT POLICY The goal of the Citrus County Debt Management Policy adopted by the Board of County Commissioners, is to provide guidance for managing the issuance of the County s Debt Obligations and maintaining the County s ability to incur debt and other long-term obligations at favorable interest rates for capital improvements and equipment deemed by the County Commission to be beneficial to the County and necessary for essential services. The Debt Policy identifies debt management goals and standards, which the County Commission must consider when committing to fund requests for infrastructure improvements. Those policies will guide the County Commission in its evaluation of the impact of each funding decision on the County s debt capacity. 2 Page 2 of 8 IV. COMPREHENSIVE CAPITAL PLANNING & FINANCING SYSTEM 1. Capital Improvements Plan The County shall develop a multi-year capital program for consideration and adoption annually by the Board of County Commissioners. The capital program identifies revenue sources and expenditures for a five-year period. 2. Review of the Proposed Capital Budget The County Administrator and Management & Budget Director will review the capital projects proposed to be financed with debt for compliance with the debt policy. In formulating recommendations to the Board, the following factors will be considered: Legal constraints on debt capacity and various financing alternatives. The urgency of the capital requirements to be met and the economic costs of delays. Willingness and financial ability of the taxpayers to pay for the capital improvements. Determination as to whether to employ a pay as you acquire versus a pay as you use approach. Proper balance between internal and external financing. Current interest rates and other market considerations. The financial condition of the County. The types, availability and stability of revenues to be pledged for repayment of the debt. Type of debt to be issued. The nature of the projects to be financed. 3. Funding of the Capital Improvement Program: Whenever possible, the County will first attempt to fund capital projects with grants. When such funds are not sufficient, the County shall use dedicated revenues to fund the project. If these are not available, the County will use general revenues or bond financing. The County will consider the principles of equity and efficiency in selecting a funding source. Equity- Whenever appropriate, the beneficiaries of a project or service will pay for it. For example, if a project is a general function of government that benefits the entire community, such as a jail or a government building, the project will be paid for with the general revenues or financed with revenue bonds. If, however, the project benefits specific users, such as water and sewer facilities, the revenues will be derived through user fees or charges and assessments. Efficiency- If grants or current revenues are not available to fund a project, the County will select a financing technique that provides for the lowest total cost consistent with acceptable risk factors. These methods currently consist of bank financing or revenue bonds issued by the County or special funding programs funded by state or federal agencies. An example is the State Revolving Loan Program. 3 Page 3 of 8 4. Maintenance, Replacement and Renewal- The County intends to set aside sufficient current revenues to finance ongoing maintenance needs and to provide periodic replacement and renewal consistent with its philosophy of keeping its capital facilities and infrastructure systems in good repair and to maximize a capital asset s useful life. It is the County s policy to develop master plans for scheduling this maintenance. V. LONG TERM CAPITAL DEBT POLICY 1. Long-term obligations will not be used for operation-purposes. 2. Debt service structure will approximate level debt service unless operational matters dictate otherwise. The County will strive to limit its annual issuance of long-term obligations to either $5 million to take advantage of small issuer exemptions in the federal arbitrage laws regarding arbitrage rebate and $10 million to maintain bank qualification status. Should subsequent changes in the law raise these limits, then the County s policies will be adjusted accordingly 3. Historically, the County has issued tax-exempt debt because their uses of funds are for traditional, tax-exempt purposes, and tax-exempt rates provide substantial savings over taxable debt. Assuming these conditions continue, the County will not use taxable debt. 4. To avoid charging users for facilities, which do not benefit them, debt will not be issued for a term exceeding the useful life of the facilities, as defined by generally accepted engineering and financial principles. VI. 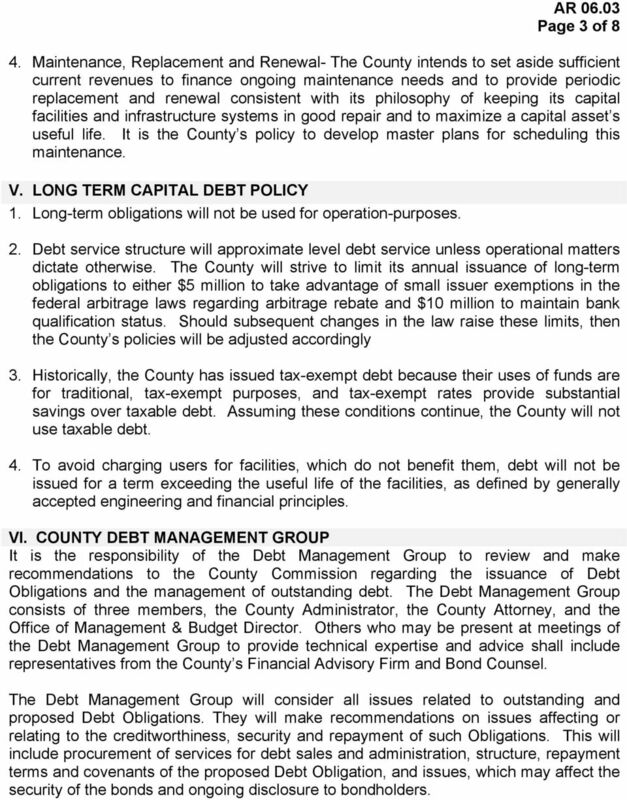 COUNTY DEBT MANAGEMENT GROUP It is the responsibility of the Debt Management Group to review and make recommendations to the County Commission regarding the issuance of Debt Obligations and the management of outstanding debt. The Debt Management Group consists of three members, the County Administrator, the County Attorney, and the Office of Management & Budget Director. Others who may be present at meetings of the Debt Management Group to provide technical expertise and advice shall include representatives from the County s Financial Advisory Firm and Bond Counsel. The Debt Management Group will consider all issues related to outstanding and proposed Debt Obligations. They will make recommendations on issues affecting or relating to the creditworthiness, security and repayment of such Obligations. This will include procurement of services for debt sales and administration, structure, repayment terms and covenants of the proposed Debt Obligation, and issues, which may affect the security of the bonds and ongoing disclosure to bondholders. 4 Page 4 of 8 VII. PLANNING AND STRUCTURE OF COUNTY INDEBTEDNESS 1. Financing Team The County employs outside financial specialists to assist it in developing a bond issuance strategy, preparing bond documents and marketing bonds to investors. The key players in the County s financing transactions include its financial advisor and bond counsel, the underwriter (on a negotiated sale) and County representatives (County Administrator, County Attorney, Management and Budget Director). Other outside firms, such as those providing disclosure counsel, paying agent/registrar, trustee, credit enhancement, auditing, arbitrage compliance, or printing services, are retained as required. 2. Financial Advisor The County will retain an external financial advisor through a competitive process administered by the Office of Management and Budget. The utilization of the financial advisor for particular bond sales will be at the discretion of the County on a case by case basis and pursuant to the financial advisory services contract. The selection process for financial advisors will require comprehensive debt experience, experience with diverse financial structuring requirements and pricing of municipal securities. The Financial advisor will advise on the structuring of obligations to be issued, I inform the County of various options, advise the County as to how choices will impact the marketability of County obligations, and will provide other services as defined by their contract. To ensure independence, the financial advisor will not bid on nor underwrite any County debt issues. 3. 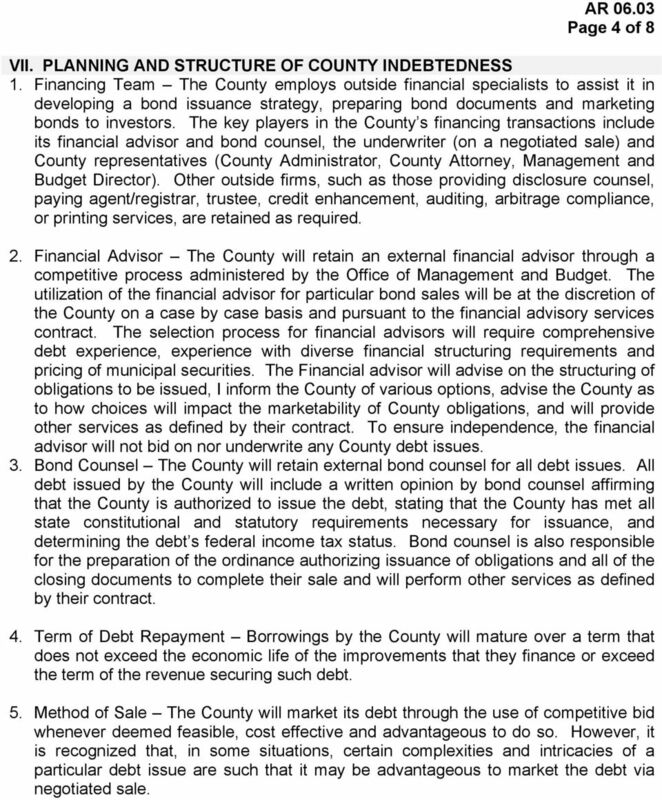 Bond Counsel The County will retain external bond counsel for all debt issues. 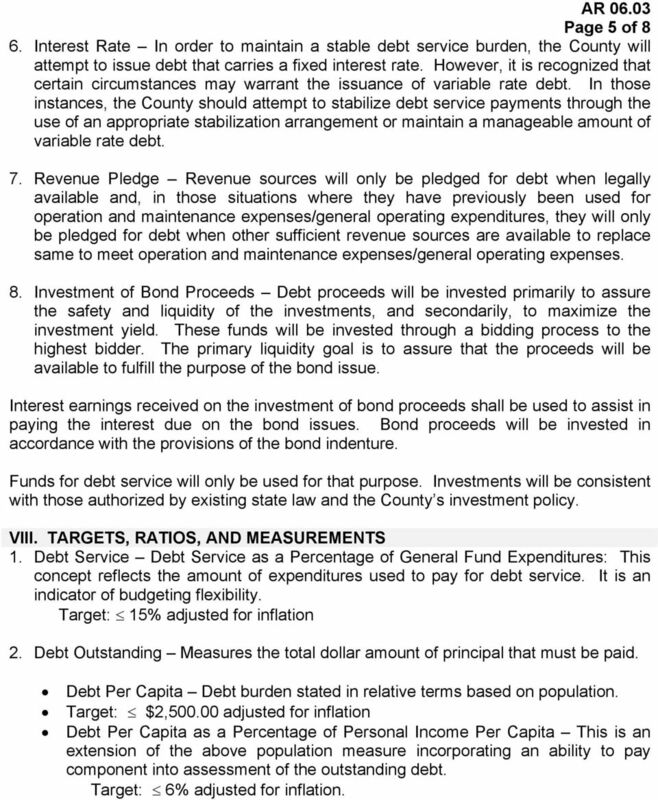 All debt issued by the County will include a written opinion by bond counsel affirming that the County is authorized to issue the debt, stating that the County has met all state constitutional and statutory requirements necessary for issuance, and determining the debt s federal income tax status. Bond counsel is also responsible for the preparation of the ordinance authorizing issuance of obligations and all of the closing documents to complete their sale and will perform other services as defined by their contract. 4. Term of Debt Repayment Borrowings by the County will mature over a term that does not exceed the economic life of the improvements that they finance or exceed the term of the revenue securing such debt. 5. Method of Sale The County will market its debt through the use of competitive bid whenever deemed feasible, cost effective and advantageous to do so. However, it is recognized that, in some situations, certain complexities and intricacies of a particular debt issue are such that it may be advantageous to market the debt via negotiated sale. 5 Page 5 of 8 6. Interest Rate In order to maintain a stable debt service burden, the County will attempt to issue debt that carries a fixed interest rate. However, it is recognized that certain circumstances may warrant the issuance of variable rate debt. In those instances, the County should attempt to stabilize debt service payments through the use of an appropriate stabilization arrangement or maintain a manageable amount of variable rate debt. 7. Revenue Pledge Revenue sources will only be pledged for debt when legally available and, in those situations where they have previously been used for operation and maintenance expenses/general operating expenditures, they will only be pledged for debt when other sufficient revenue sources are available to replace same to meet operation and maintenance expenses/general operating expenses. 8. Investment of Bond Proceeds Debt proceeds will be invested primarily to assure the safety and liquidity of the investments, and secondarily, to maximize the investment yield. These funds will be invested through a bidding process to the highest bidder. The primary liquidity goal is to assure that the proceeds will be available to fulfill the purpose of the bond issue. Interest earnings received on the investment of bond proceeds shall be used to assist in paying the interest due on the bond issues. Bond proceeds will be invested in accordance with the provisions of the bond indenture. Funds for debt service will only be used for that purpose. Investments will be consistent with those authorized by existing state law and the County s investment policy. VIII. TARGETS, RATIOS, AND MEASUREMENTS 1. Debt Service Debt Service as a Percentage of General Fund Expenditures: This concept reflects the amount of expenditures used to pay for debt service. It is an indicator of budgeting flexibility. Target: 15% adjusted for inflation 2. Debt Outstanding Measures the total dollar amount of principal that must be paid. Debt Per Capita Debt burden stated in relative terms based on population. Target: $2, adjusted for inflation Debt Per Capita as a Percentage of Personal Income Per Capita This is an extension of the above population measure incorporating an ability to pay component into assessment of the outstanding debt. Target: 6% adjusted for inflation. 6 Page 6 of 8 IX. 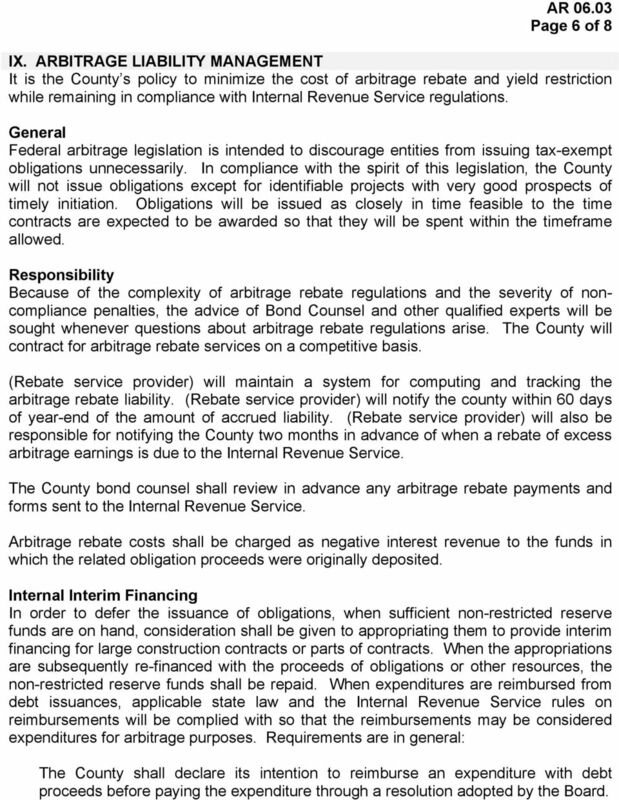 ARBITRAGE LIABILITY MANAGEMENT It is the County s policy to minimize the cost of arbitrage rebate and yield restriction while remaining in compliance with Internal Revenue Service regulations. General Federal arbitrage legislation is intended to discourage entities from issuing tax-exempt obligations unnecessarily. In compliance with the spirit of this legislation, the County will not issue obligations except for identifiable projects with very good prospects of timely initiation. Obligations will be issued as closely in time feasible to the time contracts are expected to be awarded so that they will be spent within the timeframe allowed. Responsibility Because of the complexity of arbitrage rebate regulations and the severity of noncompliance penalties, the advice of Bond Counsel and other qualified experts will be sought whenever questions about arbitrage rebate regulations arise. The County will contract for arbitrage rebate services on a competitive basis. (Rebate service provider) will maintain a system for computing and tracking the arbitrage rebate liability. (Rebate service provider) will notify the county within 60 days of year-end of the amount of accrued liability. (Rebate service provider) will also be responsible for notifying the County two months in advance of when a rebate of excess arbitrage earnings is due to the Internal Revenue Service. The County bond counsel shall review in advance any arbitrage rebate payments and forms sent to the Internal Revenue Service. Arbitrage rebate costs shall be charged as negative interest revenue to the funds in which the related obligation proceeds were originally deposited. Internal Interim Financing In order to defer the issuance of obligations, when sufficient non-restricted reserve funds are on hand, consideration shall be given to appropriating them to provide interim financing for large construction contracts or parts of contracts. When the appropriations are subsequently re-financed with the proceeds of obligations or other resources, the non-restricted reserve funds shall be repaid. When expenditures are reimbursed from debt issuances, applicable state law and the Internal Revenue Service rules on reimbursements will be complied with so that the reimbursements may be considered expenditures for arbitrage purposes. Requirements are in general: The County shall declare its intention to reimburse an expenditure with debt proceeds before paying the expenditure through a resolution adopted by the Board. 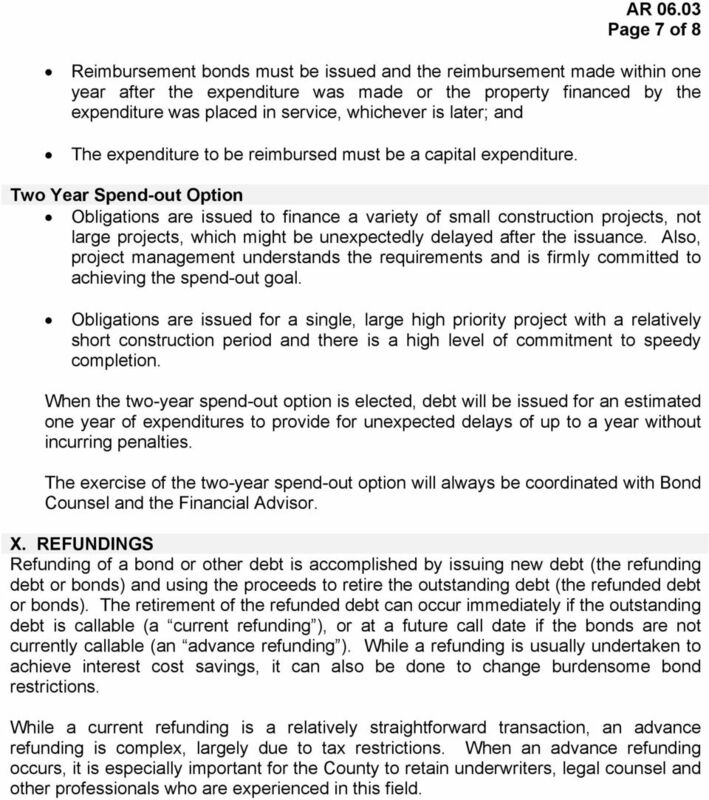 7 Page 7 of 8 Reimbursement bonds must be issued and the reimbursement made within one year after the expenditure was made or the property financed by the expenditure was placed in service, whichever is later; and The expenditure to be reimbursed must be a capital expenditure. Two Year Spend-out Option Obligations are issued to finance a variety of small construction projects, not large projects, which might be unexpectedly delayed after the issuance. Also, project management understands the requirements and is firmly committed to achieving the spend-out goal. Obligations are issued for a single, large high priority project with a relatively short construction period and there is a high level of commitment to speedy completion. When the two-year spend-out option is elected, debt will be issued for an estimated one year of expenditures to provide for unexpected delays of up to a year without incurring penalties. The exercise of the two-year spend-out option will always be coordinated with Bond Counsel and the Financial Advisor. X. REFUNDINGS Refunding of a bond or other debt is accomplished by issuing new debt (the refunding debt or bonds) and using the proceeds to retire the outstanding debt (the refunded debt or bonds). The retirement of the refunded debt can occur immediately if the outstanding debt is callable (a current refunding ), or at a future call date if the bonds are not currently callable (an advance refunding ). While a refunding is usually undertaken to achieve interest cost savings, it can also be done to change burdensome bond restrictions. While a current refunding is a relatively straightforward transaction, an advance refunding is complex, largely due to tax restrictions. When an advance refunding occurs, it is especially important for the County to retain underwriters, legal counsel and other professionals who are experienced in this field. 8 Page 8 of 8 A critical IRS restriction is to limit an issuer to no more than one advance refunding for each issue after August As a result, the County must carefully evaluate the appropriateness of advance refunding when an opportunity arises because there will be only one chance to reduce interest cost of the refunded bond until the call date, if any. 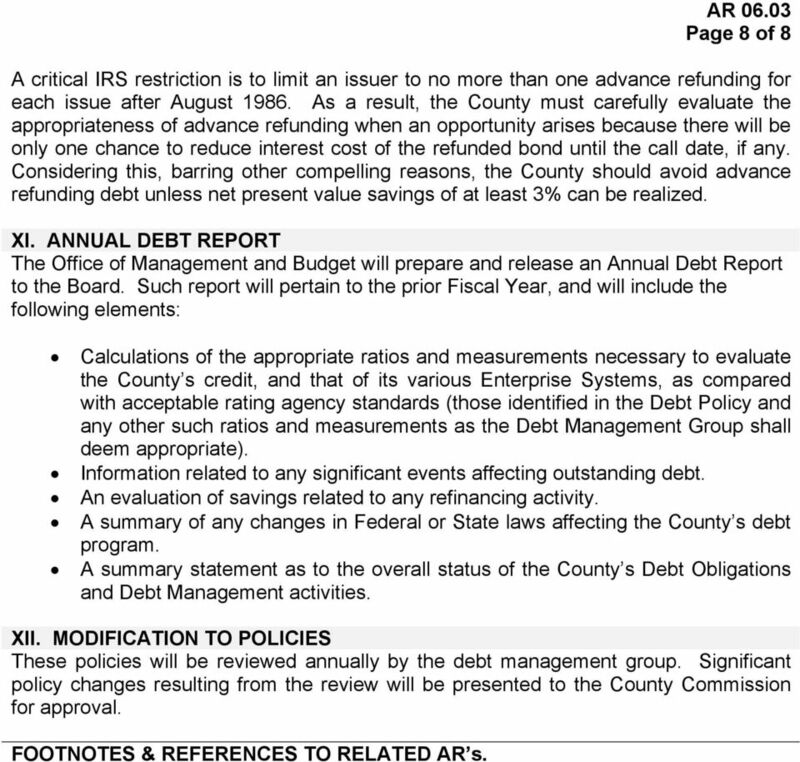 Considering this, barring other compelling reasons, the County should avoid advance refunding debt unless net present value savings of at least 3% can be realized. XI. ANNUAL DEBT REPORT The Office of Management and Budget will prepare and release an Annual Debt Report to the Board. Such report will pertain to the prior Fiscal Year, and will include the following elements: Calculations of the appropriate ratios and measurements necessary to evaluate the County s credit, and that of its various Enterprise Systems, as compared with acceptable rating agency standards (those identified in the Debt Policy and any other such ratios and measurements as the Debt Management Group shall deem appropriate). Information related to any significant events affecting outstanding debt. An evaluation of savings related to any refinancing activity. A summary of any changes in Federal or State laws affecting the County s debt program. 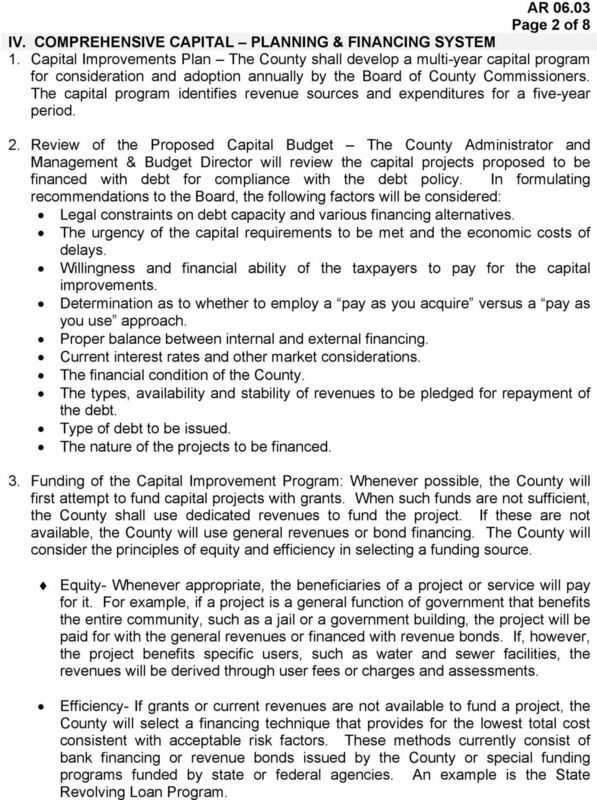 A summary statement as to the overall status of the County s Debt Obligations and Debt Management activities. XII. MODIFICATION TO POLICIES These policies will be reviewed annually by the debt management group. Significant policy changes resulting from the review will be presented to the County Commission for approval. FOOTNOTES & REFERENCES TO RELATED AR s.
Nashua Pre-filed Testimony Of Steven A. Adams First Southwest Company. 1. What is your name and by whom are you employed?